What fun we had at Grafham this weekend. In one race on Sunday I looked across to see Paul pitchpole and with extreme grace walk over his mast, George�s capsized boat floating across the Lake with no sign of George?, Chris water skiing behind his boat holding on to the trapeze wire. It was a surreal scene. The rest of the weekend was more organised. Grafham is a lovely venue. Camping for Chris and Barbara on the lake side, George and Margaret in their luxury campervan and John, Gareth and me in luxury B&B, Alastair was hotelling and I do not know what happened to Paul? This was the magnificent seven. Saturday�s races were three back-to- back. 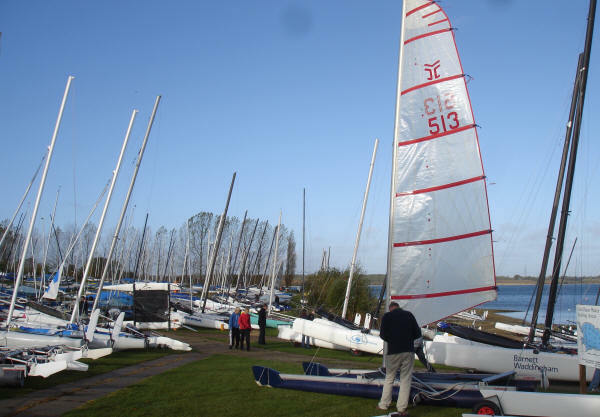 Out start had 30 boats out of 117 at the meeting. Gareth was leading Catapult as usual but we had fun at the back of the fleet competing at every mark with plenty of overtaking action. Rain and strong winds leading to exciting sailing. I was the only one to capsize after overzealous trapezing. That evening jolly fun was had by all in the Wheatsheaf. Below: Alastair prepares calmly on Sunday morning in front of the fleet---sunshine, a blue lake, flat water, a good breeze---what could go wrong? Sunday�s races were severe and stretching, starting in bright sunshine another back-to-back of three which only half the fleet would survive. First race. Overzealous trapezing in 25 mph wind on a close reach overtaken George I met my downfall and capsized in the first race. From them on I would be more conservative. Paul pitchpolled running downwind, Alastair was manfully trapezing. Second race. George pitch polled and then could not swim fast enough to keep up with his boat. He was re-united with it by the rescue men and returned to the fray. Chris capsized twice eventually spending 20 mins in the water as the overworked safety boat eventually got to him. He retired with damaged rig and cold. John sensibly retired after surviving two races with conditions worsening. It was the only sensible thing to do and I cannot think why the rest of us did not join him? Congratulations to Gareth for 4th prize overall in the medium handicap fleet. .On Saturday, with a front coming through, three back-to-back races had fresh southerly breezes (bracing rather than warm) at comfortable trapezing strength. Under grey cloud with a Force 4 southerly breeze, Alastair Forrest�s good starboard end start took him first round the windward mark, but Gareth Ede following close caught him on the reach, and after a battle held on to first. Paul Ellis caught Alastair for second, and in turn was caught again downwind before regaining enough of a lead on the next beat to hold second for the rest of the race, in touch but not gaining on Gareth. For Race 2, the forecast rain swept through on lap 2 with the breeze up briefly under the front before the rain flattened it. Alastair and Paul held good starting positions only to stall on the final slow approach, and Gareth swept through, to take and hold the lead. Paul passed Alastair to hold second but not threaten Gareth�s building lead on all legs. These places held for the next laps, with George Evans came away from the battle for the other places, pulling up to close on Alastair for fourth, while the other three finished in close competition. The rain cleared and Race 3 got off in sunshine, around 17 knots. Alastair�s good start got him first to the windward mark just ahead of Gareth who came past him downwind followed by Paul. The front two extended their lead in that order to the finish. Sunday brought bright sunshine and a flat blue lake seen from the sheltered clubhouse (see photo above) but with a forecast of rising SW wind, and dark gusts near the far shore. The three back-to-back races became a daunting task for everybody on the water. For Race 4, Gareth was perfecting starting at speed, staying well back and powering in at the starboard end of the line avoiding the tangle of competing Shearwaters and getting away. Alastair followed him round the first lap but touched the leeward mark with the tiller extension, and in a wild 360, attempting the gybe amongst the beating fleet, dropped right back. Paul chasing Gareth did a high-speed reaching nosedive and capsized, with a good recovery. George pulled out from the rest, and Alastair and Paul chasing up found that the conditions had claimed Nigel Harrison, with Alastair reclaiming third by two seconds from Paul., with Chris Phillips the other survivor. Before Race 5 John and Paul concluded that the increasing wind would be overwhelming and headed home. Gareth again had a storming start coming in from long range, to be at the first mark a little ahead of Alastair. These two trapezing stayed out in front although the boats following, when electing not to trapeze, held good boat speed and could push up in the gusts, sheeted hard in. Nigel came in ahead of George,. The conditions claimed Chris, falling while trapezing, staying connected to the capsized boat only by the wire (hook released) and being dragged after it. For Race 6, the five Catapults were the largest group remaining in the mixed fleet, with the gusts dark across the water diminishing the takers. The large Sprint 15 fleet was being picked off all over the lake. Again, Gareth�s well-timed high-speed start got him away well, to catch Alastair after the first mark, these two moving out ahead trapezing. Storming close behind Gareth down the leeward reach on the second lap, Alastair pitchpoled, the boat sailing under without a warning dip or check. He failed to right it. George came on steadily to press Gareth�s hold on first, with Nigel gaining third.